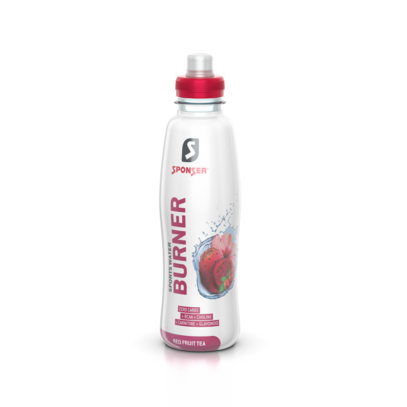 SPORTS WATER BURNER of SPONSER® is a low-calorie sports drink without added carbohydrates or sugar. Ideal for replenishing fluids during sports without adding more calories. SPORTS WATER BURNER contains the polyphenol plant extracts, Glavanoid® and Catinea™, as well as BCAA amino acids, L-carnitine but also choline which supports normal fat metabolism. Especially suitable for metabolic training in endurance sports but also for weight loss. The refreshing SPORTS WATER BURNER is flavoured with RED FRUIT TEA and not only tastes good before, during or after sports but also makes a great snack. For further information & purchase please click/select the product in the slider below.